IFLN member Eurogate Logistics is handling challenging, potentially dangerous shipments on a consistent basis. The Prague-based forwarder has been overseeing shipments of lithium batteries from China to Prague for a year now, the batteries mainly moving from Hong Kong and Shenzhen in the south, as well as in smaller quantities from the Chinese ports of Shanghai and Ningbo further north, all the way to the Czech Republic. 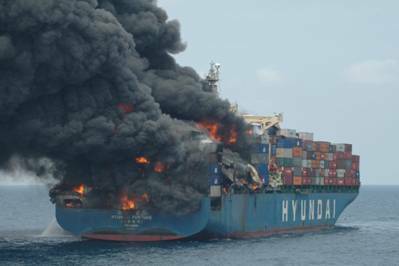 What can happen when dangerous goods are not properly packed, stowed and declared. The dangerous cargo is moved by sea from those Chinese ports to the German gateways of Hamburg or Bremerhaven, before the consignment is flown direct to Prague. There are strict limitations on the movement of these batteries and an IATA DGR (International Air Transport Association Dangerous Goods Regulations) and IMO (International Maritime Organization) certificate are prerequisites for Eurogate before it can think of shipping this dangerous cargo (although, as Eurogate director Petr Rozek pointed out, other non-IFLN forwarders are perhaps not always so scrupulous, on occasion shipping without the required DGR declarations). Eurogate is working with a Chinese IFLN partner to ensure that the batteries are properly declared and safely shipped out of China. Eurogate also provided the relevant customs brokerage and AAR (against all risks) insurance at what Rozek noted is a very reasonable price. Despite the various challenges, Eurogate has built up a regular trade lane in these potentially lethal shipments, meeting their customer's expectations on a continuing basis. The IFLN Network consists of 290 specialist freight companies in more than 100 countries with high standards of quality, conduct, and business practices enabling them to compete with the multinational logistics companies on a global basis. IFLN has carefully selected Vienna, Austria to host its 26th Worldwide Membership Conference, March 31 – April 3, 2019. Due to its accessibility and central geographical location, the conference in Vienna promises to bring together a record number of fellow IFLN members, including the new IFLN Global Projects group, building upon the success of the Montreal 2018 Conference that was well-represented by key decision-makers from more than 85 countries.